Your financial support is needed to sustain and grow person-to-person diplomacy. This is how you are changing the world. You help leaders like Harry tackle the world’s biggest challenges through international exchange. Please set Quantity to Gift Amount. Please set the Quantity to your gift amount. Call 215-683-0999 Monday - Friday from 9 AM to 5 PM. 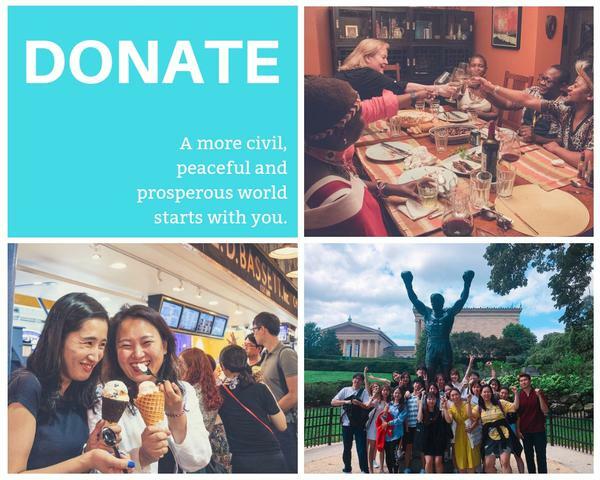 It is easy to contribute appreciated securities in the form of stocks, bonds, or mutual funds Gifts to Citizen Diplomacy International to make your charitable work go farther. We wish to ensure gifts are properly received and acknowledged. Please email andrea.silva@cdiphila.org either before or after donating securities. A copy of Citizen Diplomacy International's official registration and financial information may be obtained from the Pennsylvania Department of State, by calling, within Pennsylvania, 1.800.732.0999. Registration does not imply endorsement.